Unlike with previous versions, the upgrade can applied to your current key code instead of receiving a new upgrade key code. The license information will update automatically once it communicates with our activation servers. The easiest means to trigger this is to restart the computer or server. Open the Administration Console on a computer or with a user that has permissions to work with the license. When the license list populates, right click on the upgraded license. Your license information should now be refreshed. Upgrading editions in version 2016 and earlier generally only involves deactivating your current installation and then reactivating it with the upgraded product key code. The upgrade process varies depending on which editions you are upgrading from and to. Note: Basic and Professional editions are user based editions, which means the license is restricted to being installed and activated on one computer. Automation and Enterprise Automation are printer based editions (unlimited users), which means you can install and activate an unlimited number of BarTender clients, but the license is restricted to printing to a limited number of printers, which is is controlled with an additional application called the Seagull License Server. This upgrade requires deactivating and reactivating both the Seagull License server and the BarTender client. First, deactivate the BarTender suite (client) and the Seagull License Server by following the steps listed here: How to Deactivate BarTender. You will need to perform this step for all clients you wish to upgrade. Select Activate BarTender Suite. Click Next. Enter new upgraded product key code (the product key code you received in your upgrade email). Click Next. Read the Activation Policy and check the box I Agree. Click Next. Select the Country where the BarTender client will be activated. The next window will mention activation requires a working internet connection. Click Next. If you do not have one, please follow the instructions here for alternate means to activate your software. It will display the connection status. Once completed click Finish. To verify activation was successful click Help -> About. The Activation Status should be Activated and the Edition should now say your new edition. Close About. You will need to decide where you want to install the Seagull License Server - it may go on a desktop workstation, but we recommend a central location such as an application server if available. Installing Seagull License Server (Standalone) - For installing the License Server as a standalone application (BarTender not installed) on a new computer (ie. an application server). Installing BarTender Automation or Enterprise Automation - For installing the License Server and BarTender on a new computer. Adding Seagull License Server To An Existing BarTender Installation - For installing the License Server on a computer that already has BarTender installed. 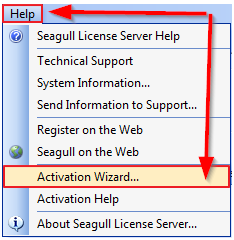 Once you have installed, activated, and started the Seagull License Server in your chosen location, return back to the top of the page. 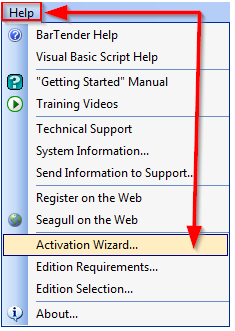 The Activation Status should be Activated and the Edition should now say Enterprise Automation. Close About. Once the License Server is activated, you may need to start it. If the play button on the UI is green, click it to start the License Server and follow any dialogs. If it is grayed out, your License Server is running and you may close the program. What about upgrading from older versions to newer version? Should the previous version be uninstalled or can the new version be installed/upgraded over the previous version? Will custom labels need to be saved/backup then remapped?